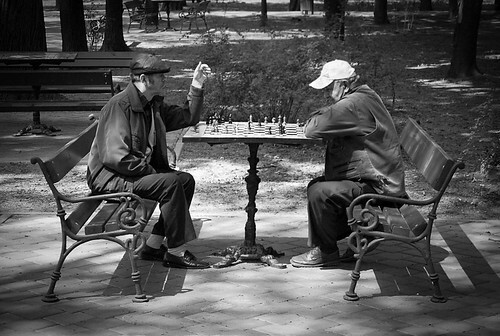 Playing chess in the park: A picture of community in the third place. (cc image courtesy Eugene Anghel via Flickr). In our fast-paced, technological, over-scheduled, and over-worked society it is still “not good for man to be alone.” We thirst for a “third place” where we can be with others. The term “third place” refers to those common spaces in a community where people can meet old friends and strangers, converse, be neighborly, and generally engage in all those activities which are the lifeblood of any true community. Sociologist Ray Oldenburg, in his book The Great Good Place, writes of the need for a “third place—outside the home and the workplace—to foster community life. Third places are usually free or inexpensive, walkable, accessible to strangers but also having many regulars, and are less intimate than a home but not places of complete anonymity. People who know each other well. Mutual service within the community. The kind of intimate knowledge of a place that comes with a long history there. Hospitality and the free exchange of gifts. By creating a third place if there isn’t one. By entering an existing third place and becoming a part of its life. The church building can be an ideal locale for a third place. This is the “if you build it, they will come” model—it is about stepping into a vacuum within a community and filling a need. So how can your church maximize the benefit of its place for your community? Cafes. Coffee is the coin of the realm of America’s new third places. The coffee house has a firm place in American culture; it is the community’s common ground. Many churches are large enough to have cafes in them. If your church is one of those, or if it already has a cafe for churchgoers, consider keeping the building open for people who want to come on other days than Sunday. Gardens. Does your church have space for landscaping or a garden? Outdoor spaces are ideal third places. A church lawn can become a third place with a little landscaping, a few benches, space for plants and flowers, or even a fire-pit. Open Fields. Well-kept fields of grass can be used for many purposes that foster community life. They can be the perfect spot for everything from picnics to neighborhood intramural leagues, from soccer practice to farmers markets. Third places are often places with access to food and drinks, making coffee shops the perfect candidates. Coffee houses. With the rise of telecommuting, coffee shops have only taken a greater place in the fabric of community life. Coffee shops are perfect third places because they are not as intimate as a home and facilitate both deepening old friendships and meeting strangers. Churches can impact their communities merely by being a presence in coffee shops and entering the relational and cultural exchange taking place there. A few ways your church can do this is by sponsoring an open-mic night, selling their coffee at church, or by holding a church art show there. Community centers. As their name implies, community centers are often the heart of their communities. These are places where people can exercise, take their children for day care, hold concerts, take classes, and hear the community’s news. The infrastructure of service is already in place; all churches need to do to serve their communities is plug in. This can take the form of members of your congregation teaching a parenting class (or enrolling in one), attending events, or joining the board. Go to your local community center and find out what is happening there and what their needs are.